Teaching swimming is by far the most rewarding job role I have had in the leisure industry. As a swimming teacher you have the important role of teaching a swimmer a life skill. The journey of taking a swimmer from beginner to advanced and seeing their reaction when they achieve something new is priceless. Admittedly, teaching swimming is not always a plain sailing job and there are challenges along the way. Nevertheless, the challenging can be the most rewarding! Enjoy what you do and incorporate fun, not necessarily through games but through your language. Speak to the swimmer in the language for their age. Include stories, television programmes – a Peppa Pig adventure (helping Peppa and George scoop ice creams for their friends (teaching front crawl arms) always goes down well! Time – similar to patience, allow swimmers to progress in their time and learn when to push and when to offer more encouragement. I could add so much to this list! How do I start to become qualified? The following qualifications/documents are required for becoming a swimming teacher – marked with mandatory and desired. Please note that there are two providers who train swimming teachers; Amateur Swimming Associations (changed to Swim England in April 2017), courses provided through the Institute of Swimming (IoS) or the STA. Discipline specific – water polo, synchronised swimming…. During and after your courses, I strongly recommend that you seek experience with a variety of swimming lesson providers. Always continue your personal development and learn the various scenarios you can face! 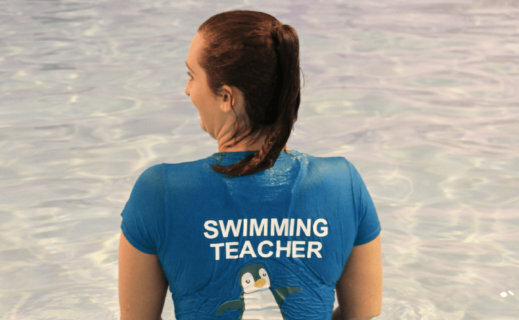 Knowledge and experience are key to becoming a successful swimming teacher! If you would like further guidance, interested in becoming a swimming teacher, contact Nicole today.